Some clouds this morning will give way to generally sunny skies for the afternoon. High 71F. Winds W at 10 to 20 mph..
Malcolm Hardy’s personal best 8.4-pound Clear Lake largemouth bass. Bill Ryan on a serious Folsom Lake breakout session at the OWAC Spring Conference, held in late May in Auburn. Doug Roberts caught this 5.5-pound wild rainbow trout fishing with Bill Ryan on the Sacramento River. Pros like ’em? You bet. Three different bass pros won recent major tournaments right here close to home with a Blade-Runner lure: California Delta, Berryessa and Clear Lake. Note that I was soaking up some rays while on a conference breakout session; somehow, I missed the turn in the hallway to the meeting room. Oh well. 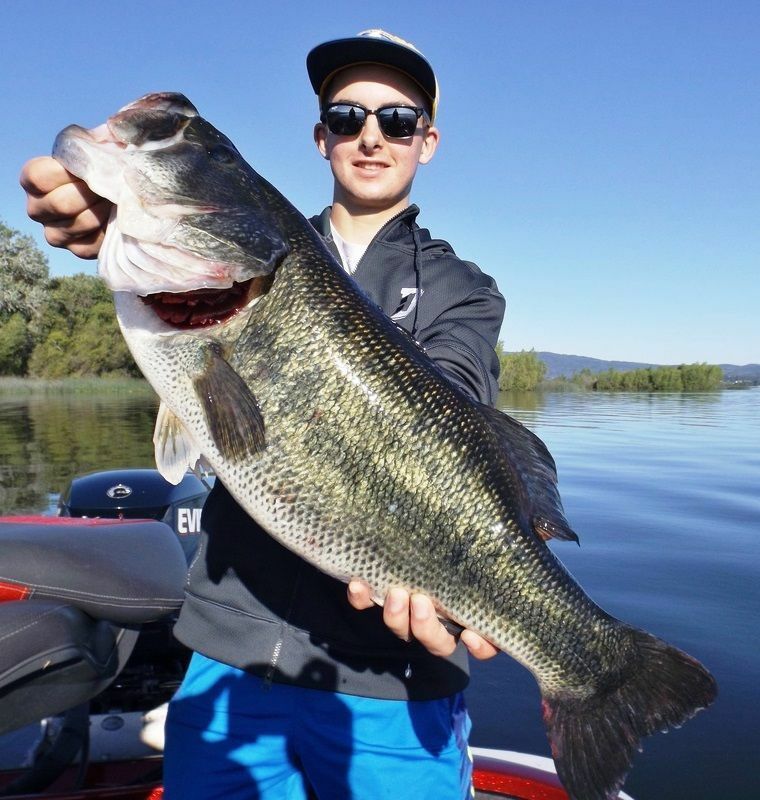 Bass fishing was just one of dozens of special outdoor events arranged by our Placer County hosts; this event was helmed by pro guide Don Paganelli (916-502-FISH), who also guides on Berryessa and Clear Lake. Fellow members took advantage of these other activities: trap shooting, fly fishing, bike tours, rock climbing, a road trip to the Sierra Nevada as well as full-day Tahoe tours. Serious stuff … Our banquet speaker, Bob Kingman, executive director of the Sierra Nevada Conservancy, gave us a heads-up and a challenge to tell Californians about the long-term harm from forest fires. Bottom line: We are upside down on how to combat them. We are spending millions to put them out, while ignoring the reality that we need to prevent them. Huge industries and special interests are working on the wrong objective. The devastating wildfires here in recent years have caused many permanent problems. Killing trees, critters and people; causing ashes that cover fish nests and kill the fry. Heavy accumulated fuel load makes these fires hotter and slower — sterilizing the ground to a depth of 4 feet — making it nonproductive forever. We must make a 180-degree turn to using controlled burns that clear out masses of fuel load before they get too big and feed wildfires. Mother Nature used to do that regularly — before we invented good old “Smokey Bear” and made it fashionable to be a forest firefighter. It will take a massive public outcry to start the movement. Please join me by learning more at sierranevada.ca.gov to bone up and speak out. Why? It’s called an “enlightened self-interest.” Sixty percent of all of California’s developed water supply originates in the Sierra Nevada. I’m going to ask our local politicians to put this on their short list. Stay tuned. Not your Grandpa’s Holiday Inn anymore … Our conference HQ was the modern Holiday Inn, Auburn. Great staff, beautiful big city rooms — and a real connection with Tokyo. The bathroom mirrors are back-heated so they don’t fog over from your shower, in both the Holiday Inn Auburn and my favorite hotel in Tokyo, The Palace. Our conference meetings and meals were seamless because of the solid support from the hotel conference team. In two days, Kevin put us onto 77 big wild rainbow trout. Doug was the top stick with a beautiful, full-colored 5.5-pound trout. We caught fish at every stop and all day long. Contrast these numbers with a low-flow drought year when we only caught 35 trout in two days. Out and about … I’m sick about the latest report in the SF Chronicle about an FBI agent who left his gun in his car, and it was stolen. That article recapped this year’s number of such incidents involving police and other uniformed personnel locally. It is a total failure of their leadership. If they can’t protect their firearms, I’m not very hopeful that they can protect us. St. Helenan Bill Ryan can be reached at acorn_3@comcast.net.